Many of these accidents could have been completely avoided just by wearing simple high visibility accessories, such as a pair of Safety Lights. Our Safety Lights were designed for getting the attention of motorists at a safe distance. It offers the perfect amount of light to keep you seen anywhere, anytime! We know you're going to love our Safety Lights, that's why we are offering a full 1 year warranty and a 30 day money back guarantee, when you order today. PS: This offer is only valid for a limited time. Order NOW to avail of our introductory sale price.
? NEW BONUSES ADDED: Includes 4 extra CR2032 batteries (2 sets), 2 short hook and loop fasteners (for mounting the lights to dog collars, leashes, bikes, strollers, and more), 1 long and ELASTIC strap (15.8 inches long) for ankles / wrists / arms etc, and a mini-screwdriver for a hassle-free battery replacement process. ? EASY TO USE: Clips on easily. Stays on securely. Hook the lights onto your belt, pockets, running gear, reflective vest / belt, backpack / helmet, dog collars/leashes, or anywhere else on your clothing. ? 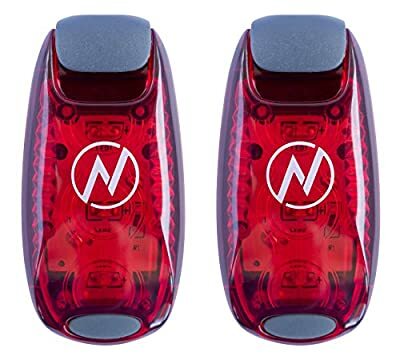 VERSATILE: Whether you enjoy running, walking, cycling, or just taking a peaceful stroll with your dog at night, these ultra-bright safety lights will keep you safe and secure - a mandatory piece of safety equipment for any low-light activity and a great addition to your outdoor- or reflective gear. ? WEATHER RESISTANT: Rain or shine, summer or winter -- any weather condition, any time -- enjoy enhanced visibility and comfort knowing you'll be safe and secure at any time of the day. ? 100% MONEY BACK GUARANTEE: Order now, with a peace of mind, RISK FREE. Your purchase is backed by our exclusive 1 Year Warranty and 30 Day Money Back Guarantee. No catches. Either you love the product or you are entitled to a 100% refund. Scroll down for more info.